Each year the experts at the Perennial Plant Association — nurserymen, plant researchers, academics and garden writers from around the world – take a look at the new, most promising perennial garden plants. From dozen’s of possibilities, they decide on what permanent garden plant is the best of the lot. Sort of the Academy Awards for nursery folks and gardeners. Although the judges don’t say so directly, they start with handsome plants and move on to “almost impossible to kill” as selection criteria, sort of best actor in an action movie. The association says the contest results help consumers pick plants they can enjoy in their gardens year after year. And, for those who garden with two black thumbs, the jury’s selection is designed to help avoid premature plant death – heartbreak and bankruptcy, car chases and tanker truck explosions. And now, may I have the envelope, please? 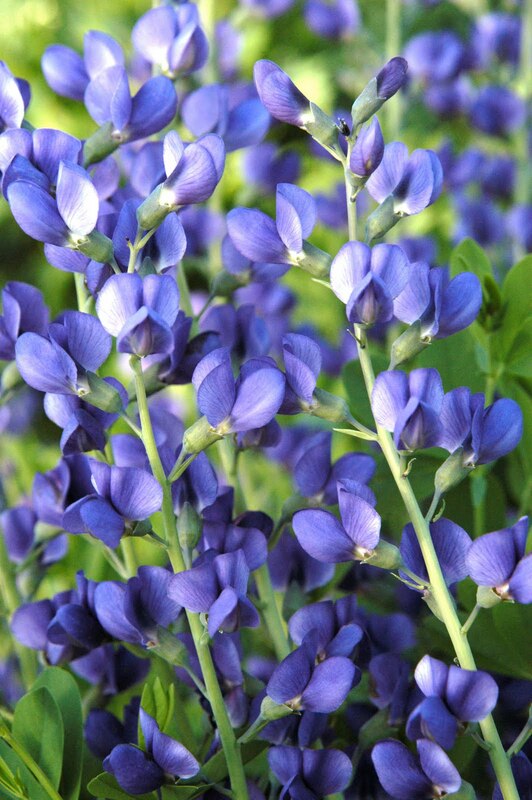 This year’s winner – drum roll, please – is a blue false indigo named baptisia australis. It grows three to four feet tall and three to four feet wide in an upright habit. It grows across a wide range of zones and is one of the most adaptable native species. In other words, a real beauty. A native North American wildflower, the experts say this false indigo is an excellent choice for sun drenched gardens all over the country. Plants form tall, bushy clumps of grey-green foliage, with long spikes of sweet pea-like flowers, in shades of violet-blue. And, bang for the buck, the plants may be increased by dividing in spring, every 4 to 5 years, or by moving any seedlings that may appear, while they’re still small. The common name, blue false indigo, refers to the use of this perennial by early Americans as a dye. One drawback, you knew there’d be one, the flowers only last a few weeks each year. Use baptisia to anchor the back of a border planting. It’s also valuable for cottage gardens, native plant gardens, and designed prairies and meadows. It’s best planted in small groups. Blue false indigo can be used with bulbs and other spring flowering perennials to make interesting combinations because the color is so vibrant. • Light – Plants thrive in full sun. Plants grown in partial shade may require staking. • Soil – This North American native is easily grown in well-drained soil and is drought tolerant after establishment. • Uses – This spring flowering shrub-like perennial may be used to fill the back of the border or in the wild garden. • Unique Qualities – The combination of flower and leaf color is dramatic in the early blooming season. Flowers are followed by inflated seed pods that are useful for dried flower arrangements. The photo of baptisia australis is courtesy of Dr. Steven Still, executive director of the Ohio-based Perennial Plant Association. To find perennial plant winners from previous years online, go to http://www.perennialplant.org/.